Buy Golden Spirit Smoketree online. 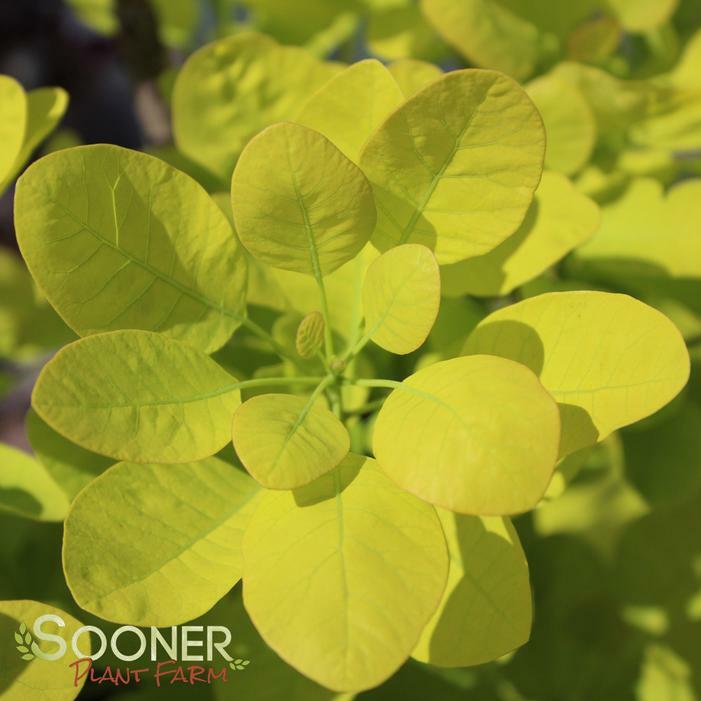 This NEW and unique plant is gaining popularity for its spring foliage that ranges from lime green to a brilliant gold color with excellent fall foliage color in shades of coral, orange, and red. Young shoots are typically slightly bronzed at the tips, which contract nicely with the older golden foliage. The foliage does not scorch in full sun unless exceptionally dry conditions prevail. Golden Spirit has pink inflorescences that will also contrast nicely with the bright golden foliage. At the 1999 Planetarium (Boskoop, Holland), Golden Spirit Smoketree won the Gold Medal Award for the+M675 "Best New Plant Introduction". This plant is best sited in full sun and will produce a dense, medium-sized (8' high by 6' wide) shrub or multi-stem tree. Great for foliage interest in any garden! Also makes a fantastic container plant.